I dated someone once who didn’t care about restaurants or going out to dinner, who just didn’t get it. “Food is just fuel,” he’d say, and he wasn’t attractive or funny enough for me to overlook his dim worldview so it didn’t last long. I suppose that food really is fuel, but in my case it also doubles as therapy; my mood depends on a few good meals, and my optimism wavers if I haven’t eaten well. And anyway, sleep is just recharging but aren’t we nonetheless very particular about the softness of our pillows and the colour of our sheets? How can there be people for whom these constant, vital acts aren’t anything but to-dos to be checked off a list? Or maybe I’m just a hedonist? Swirling maelstroms are the status quo around here; adding a toddler to the mix has not brought any order to our daily proceedings. As a grounding exercise, just before everything becomes completely unhinged (and someone innocent gets hit in the eye with the nuts and bolts), I sometimes must do something stabilizing – usually that’s some fancy food thing that requires patience and presence of mind. 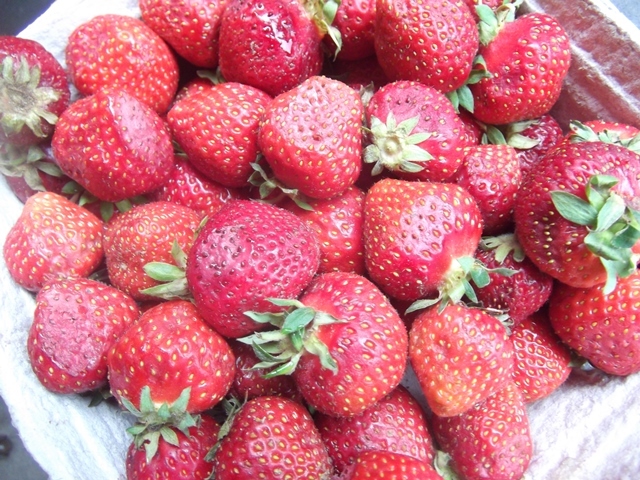 On Sunday, that stabilizing thing was the slow work of transforming eggs and the strawberries that had gone ruddy and cream into ice cream, a process that began with custard-making. Custard requires focus; failing to pay attention can turn your emulsion into sweet scrambled eggs and this recipe calls for eight egg yolks, so spoiling your custard means quite a lot of waste and probably another trip to the store and I was not wearing outside-pants because it was the weekend. You have to monitor the heat, and you have to keep stirring until the mixture thickens to the point where it coats the back of a spoon and hangs on. It is not complicated, but it does require you to fixate on the task at hand. 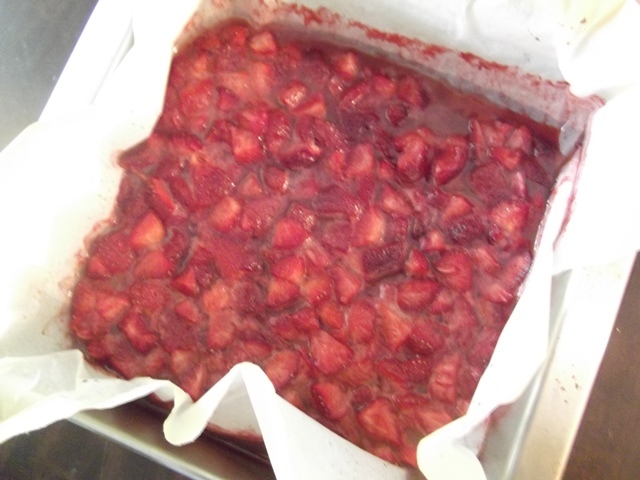 The custard formed the base for a bit of strawberry ice cream. When I started making ice cream I played with a few different recipes, but the one I ended up sticking with is David Lebovitz’s perfect vanilla ice cream. It is endlessly adaptable, and even if you don’t really know what you’re doing at first, you’ll get the hang of it pretty quickly. 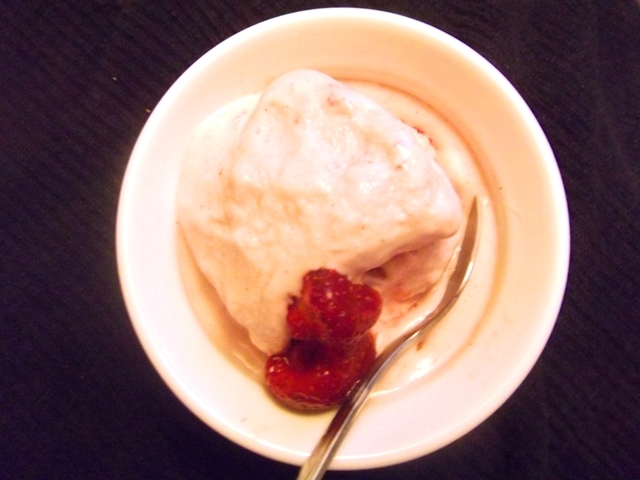 To make this ice cream, I tweaked his recipe; I used eight egg yolks instead of five, and I used a teaspoon of vanilla bean paste instead of a vanilla bean pod plus extract. If you just have a vanilla bean, or just extract, that’s fine; my vanilla bean paste is a splurge that my aunt got me hooked on when she brought a jar of it back for me from London; I found it at Gourmet Warehouse in Vancouver ($12), but you can also find it online. I will never not have it in my cupboard. To make this strawberry ice cream and not just plain old vanilla, I roasted strawberries drizzled with honey, and poured the whole mess into the ice cream machine as it churned. This is not the simplest of recipes, though it is not hard. But you have to pay attention. Put a large glass or stainless steel bowl into the freezer. Preheat your oven to 350°F. Line an 8″x8″ baking pan with parchment. 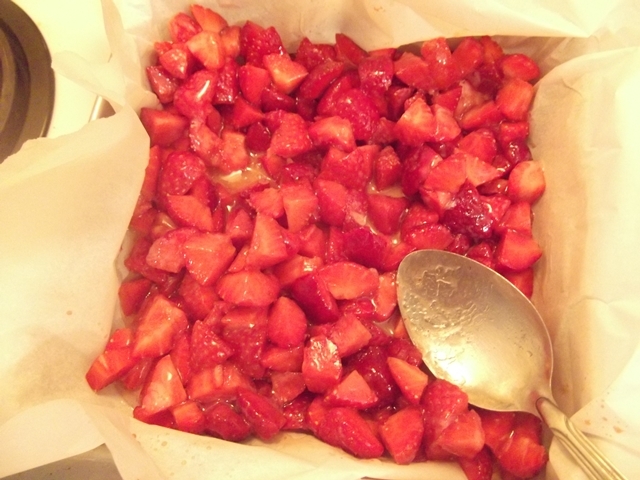 Put the strawberries into the pan, drizzle with honey, toss with a spoon to coat, then stick the pan into the oven and roast the berries for 25 to 30 minutes, until they have melted down and their juices are sticky and bubbling. Cool the berries at room temperature until you can handle the pan comfortably with bare hands, then stick them in the fridge to chill. In a saucepan over low heat, dissolve the sugar and salt in the milk. Take the bowl out of the freezer, pour the cream into it, and set a fine mesh strainer over top. Unfortunately, Nick threw my fine mesh strainer out in a fit over how annoying it was to clean before we had a dishwasher, so I only have a very small one; its diameter is just slightly shorter than that of the mug I drink my tea out of. It’s slow going, but worthwhile. In a separate bowl, whisk your egg yolks together with the vanilla. Slowly and gently pour the warm milk mixture – in a thin stream – into your bowl of egg yolks. Whisk constantly. Once you’ve poured your whole pot of milk into the egg bowl, pour the mixture back into the pot, scraping the sides of the bowl with a spatula so you get all the good stuff, and return the pot to the heat (should still be low). Whisk constantly until the mixture has thickened to the point where it coats the back of a spoon and stays put, which should take somewhere between ten and twelve minutes (if you’re meticulous, that’s 170°F). Remove the custard from the heat and strain it into the bowl of cream, stirring to combine. Cover with plastic wrap, and then stick it in the fridge, minimum four hours but ideally overnight. Pour the custard into your ice cream maker, add the strawberries, and churn according to the manufacturer’s instructions. Freeze until set. I have that same vanilla bean paste!! 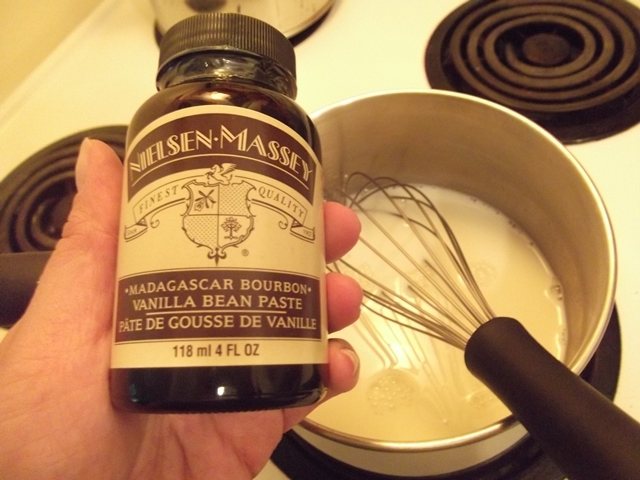 Though i tend to use it when making soy milk, or cakes, or anything requiring vanilla! I must admit i found mine at a discount store for $5 U.S. The vanilla bean paste is also available at the Galloway’s in Burnaby (at considerably less than what I paid for it in London, but definitely not $5). Ah yes, I got hooked on that vanilla bean paste too, good to know you can get it at GW. I also love that ice cream recipe. His was the first book I bought after getting an ice cream maker off craigslist and it has been great – everything out of there has turned out perfectly.